Cleaner demands compensation claiming lack of English is disability. OK, So far she hasn’t won her case. I very much doubt anyone here at BMEWS would condone cheating ppl on honest labor or taking advantage of same. But this story really smacks of lawyer(s). Lack of English? ah huh. Does this sound like an immigrant with poor English skills? “I was fed up with being cheated out of my wages, being lied to, being treated like a child or a half-whit, and being part of a scheme obviously circumventing the minimum wage legislature.” Or does it sound like lawyerspeak? Oh but wait, she didn’t know how long it took to clean a room and so she was cheated. huh? A Polish cleaner claimed her lack of English should be classed as a disability as she tried to sue her employers for alleged discrimination. Izabela Smolarek, 30, was seeking £5,000 in damages from cleaning firm ISS Facility Services Ltd on the grounds of disability discrimination. She claimed they exploited her inability to understand her job contract by paying her less than the minimum wage for cleaning rooms at a Travelodge in Luton, Beds. However her case has now been thrown out before reaching an employment tribunal after a judge ruled Miss Smolarek had no physical or mental impairment. Miss Smolarek, from Hatfield, Herts, said she had agreed to be paid £1.24 for each hotel room she cleaned, but said it was impossible to clean the three rooms an hour necessary to earn the £5.52 national minimum wage. She claimed her Polish supervisor at the Travelodge, Krizistof Kowalik, had lied to her and the other female Polish employees about how long it took to clean a room. In her claim statement, she said: “Not speaking and not understanding the language is a disability. It’s like being deaf and mute and illiterate. Miss Smolarek arrived in England from Poland on October 25 2007 and started work at the Travelodge on November 24. She lasted just over a month at the job and has also claimed she was unfairly dismissed. Her statement added: “I was fed up with being cheated out of my wages, being lied to, being treated like a child or a half-whit, and being part of a scheme obviously circumventing the minimum wage legislature. Her representative, Thomas Klarecki, told the hearing: “The law says you do not have to discuss the reasons for a disability, just the effects of the disability. However, Judge Valentine Adamson dismissed the claim at the hearing in Bedford. He said: “In the absence of any identifiable impairment, the only point being that the claimant was born in Poland and not a country where English is the first language, I find the claimant’s language difficulties are not capable of being classed as an impairment within the meaning of the Disability Discrimination Act. Miss Smolarek continues to claim she was unfairly dismissed by the London-based cleaning firm. Another pre-hearing review has been scheduled for January 12. Miss Smolarek is also claiming £981 for unpaid wages, holiday pay and notice pay. A spokesman for ISS said the company denied the allegations but would not comment further. It’s 10pm Tuesday night. I’m cooking dinner. That’s about how busy I’ve been the past 3 days. Sunday was a big carpet removal job, made even worse because it was in a really small house that was packed with furniture. And mess. Stuff everywhere, piled nearly waist high. We spent more time moving stuff so we could move furniture than getting the rugs out. I thought they said they’d clean up beforehand. Arrgh. Still, I get paid by the hour, so whatever! Monday I had tons of personal things to do. Housework, shopping, you know the drill. Can’t put it off forever or you wind up like the carpet folks above. But I didn’t have time to even check my email. Today, and likely for the rest of the week, I’ve got this handyman project. Lady calls me up; “I need a handyman. We have this rotten board in the overhang over the front door that needs replacing.” And yes, it sure was rotten. But it’s one of those projects that just cascades. To get to the board you have to remove the moulding. To remove the moulding you have to get up under the gutters where you find the fascia and the valences are rotted too. And to get at them you have to remove the gutter. Which means taking off the downspouts. And the front of this home is solid bees nests. I killed at least 4 today, either paper wasps or hornets actually. And under the rotted wood were ants. Nasty little bitty black ants, but they bite! Carpenter ants maybe? I thought they were bigger. So it’s turning into a huge project, but the homeowner doesn’t care. “do what needs doing”. I love the sound of that. Naturally, it’s nearly 100 degrees out, so I’m out there getting another sunburn and sweating buckets, as pounds of dirty grit and sawdust rain down on me. Fun fun fun! So, what’s new? How is our wonderboy doing over in Iraq and on his fact-finding tour? I haven’t even flipped the radio on, much less watched any TV. And right now I’ve got to get a load of laundry in, so I have something clean, and more importantly DRY, to wear tomorrow. Thank Peiper for posting so much in my absence. I’ll be back! So I got down to this small business that was in dire need of having clean windows. The shop looked like it was hit by a mud tornado. Almost. It’s part of a shopping center, and the parking lot and sidewalk maintenance crew had come around and powerwashed the sidewalks. Which sprayed all the dirt up on the windows, and glued it there with the dried up remains of their washing solution. Good thing I did the windows as soon as I did. There are concrete cleaning solutions that are really, really nasty. Nasty enough to etch glass. Nasty enough to destroy the rubber molding that the window glass rides in. So it took one of my custom double cleanings, but the results are typical: glass so clean it’s absolutely invisible. I know, it will only last for a few days before it gets dusty again, but that’s $50 in my pocket for an hour’s work and half an hour’s drive. And it was a smart call, to get that mess off the glass ASAP. 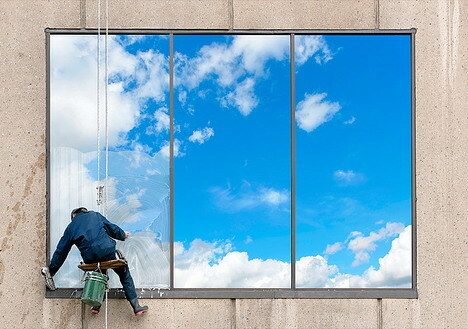 Homeowner power wash detergents aren’t usually that strong, but it is a very good idea to rinse your windows generously after doing a power wash. And then of course get out your own squeegee and make them perfectly clean. Plus, it’s fun.